Welcome back from Spring Break. We’re nearing the end of the semester and finals are just around the corner. To ease the pain, we will be hosting the Gaming Expo, right here at the UGL. 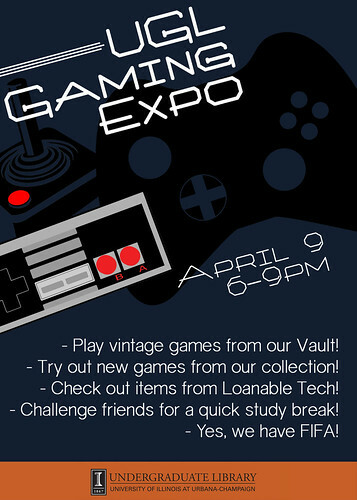 On April 9th, from 6-9 PM (upper level, near the video gaming area), you will be able to play our vintage games from our vault, compete with your buddies with games from our collection, check out our Loanable Technology items, and enjoy a study break! For those of you who are surprised, yes, we have a video game center and some great games from our collection. For all you Maria Kart fans out there, the UGL Media Collection has Double Dash, Super Circuit, Super Mario and much more. To those who are wondering, we do indeed have FIFA (2010, 2011, and so on). Some of us aren’t daily gamers, but no worries, the UGL has something for everyone. Minecraft allows players to build and construct their own world. Final Fantasy for those of us who like role-playing games. Football season may be over, but that doesn’t mean that you have to stop playing. 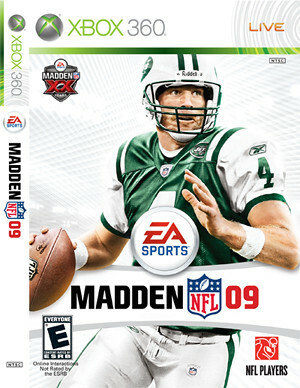 Treat yourself to some Madden NFL. We will also have some of our loanable technology out for display. If you have your own consoles and would like to play them in the comfort of your own dorm or apartment, we have what you’re looking for. 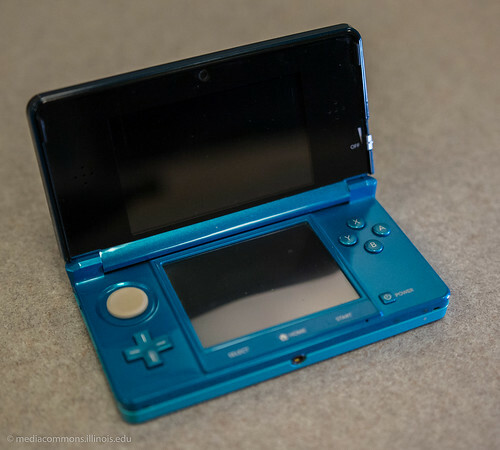 Available for checkout at the UGL are the Nintendo 3DS XL handheld gaming consoles and the Wii U and PS4. The UGL isn’t all books, come by the expo to check out the items. Last but not least, we will have our Nintendo 64, straight from our vault of vintage games and gaming consoles. Challenge your friends to an exciting game of Super Mario Kart. What are some of your favorite video games? Let us know in the comments below.